Do you wish your arms and face had a more alluring shape? Do you feel that aging has made some parts of your body sag? As human beings age, many people face an aging crisis as muscles weaken and the skin starts loosening its elasticity. One of the most effective solutions to resolve this problem is the treatment known as cell enriched fat transfer. What is cell enriched fat transfer? Also known as autologous fat transfer or fat grafting, cell enriched fat transfer is an unconventional fat harvesting and fat transfer that improves contour, assists smoothen irregularities and increases volume to sunken body parts. Most people have stubborn fat areas that refuse to cooperate no matter how much exercise and diet they undertake. With cell enriched fat transfer, this fat can be shifted gently to areas where you would like a little extra volume (like breasts, for example). Cell enriched fat transfer is a procedure where one’s body fat is used to supplement sagging and sunken parts of the body or face so as to increase volume to where it is preferred. Usually, a procedure that´s performed alone (with no other procedure like extensive body contouring) is done with local anaesthesia. StemCells21 medical team will assess each patient before the procedure as to what the preparations for this procedure will be in each case. Patients will be required to provide medical history, lifestyle history/practices (like smoking), and use of birth control pills and supplements for example. This will help the medical team to determine whether the patient can be accepted as candidate for cell enriched fat transfer or not. Patients should avoid the use of blood thinner medication at least 2 weeks before the fat injection procedure. There is no need for pro-procedure allergy testing; no foreign material will be implanted. Step 1: Fat Removal The cell enriched transfer procedure starts with liposuction where extra fat is withdrawn from the donor sites. Giver sites may possibly be thighs, buttocks, hips or the abdomen. With the purpose of harvesting many undamaged fat cells, a very low suction liposuction is used. The fat cells are extracted from the donor region using a special cannula that prevents cells damage. Step 2: Isolation Once the required fat amount has been garnered, it is spun in a centrifugal machine that splits the body fat cells from the liquid taken out by liposuction process. Spoilt fat cells are then removed. Only complete, undamaged and purified fat cells are used for the transfer. Step 3: Fat re-injection At this instant, the doctor is in a position to identify the region for each injection. 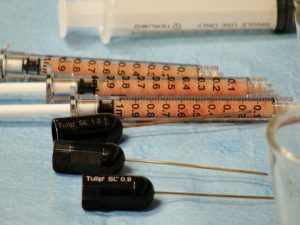 A different hypodermic syringe is used to inject fat cells at the required depth. • Breasts reconstruction and breast symmetry improvement. The procedure has outstanding and long lasting results such as enhanced breast size, visible edges, improved dimpling, even breast shape, and better overall breast contours while toning the region from which the fat was withdrawn. • Facial areas that can be corrected with fat grafting treatment include laugh lines, forehead wrinkles, hollows under your eyes, smoothing lines in the face, chin/cheek, and lip augmentation. Once the fat transfer is finished, the patient may experience slight bruising or swelling at the target site. The swelling should go away in a few days and any discomfort experienced can be controlled with pain killers. Most patients resume their daily activities within hours or a day after the procedure. Results vary with different patients. This is because the results rely on aspects like the amount of increased volume sought after and the quantity of body fat collected from the donor site. It is therefore recommended to all patients to discuss conditions and expectations before the procedure. Why enrich fat transfer with stem cells? • Stem cells can turn into any type of cell if well stimulated. • Stem cell enriched fat also reduces fat injection aggressive effects like fibrosis formation, calcification, and pseudo cyst. The cost of cell enriched fat transfer is reliant on factors like individual needs, the extent of revision to be performed, and other factors. However, the cost is more reasonable than that of many cosmetic options, particularly surgical procedures like the popular facelift. The difference between a fat grafting procedure and different types of dermal fillers is that cell fat transfer uses your own body cells. This is very helpful to those sensitive to proteins. Unlike dermal fillers, fat injection treatment has effects that last indefinitely. On the other hand, dermal fillers that have a hyaluronic acid break down and dissolve after a few months. Would you like Treatment for Cell Enriched Fat Transfer?